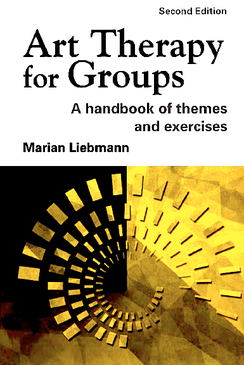 One of my favourite books for leading expressive arts groups is "Art Therapy for Groups" by Marian Liebmann. Originally published in 1986 and revised in 2004, this book explains how to implement art exercises in group settings. My first therapeutic art group consisted of middle-aged adults with acquired brain injuries, and I referred to this book every week for two years. 1. The installation of hope. 2. Seeing the universality of our common struggles. 3. Learning altruism and love. 4. Healing original family pain and patterns within a safe space. 5. Learning effective socialization techniques and new interpersonal understandings. 6. Learning how to contribute to group cohesiveness. Following is are some ideas from the book on how to stimulate imaginative imagery for intuitive painting. 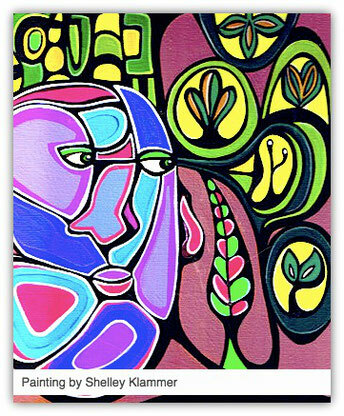 The following is excerpted from "Art Therapy for Groups" by Marian Liebmann. People need to be able to relax in order to ‘get into’ imaginative journeys, so if this is a major problem, the method is not suitable for your group—or some practice with relaxation techniques is needed first. The main point of many of these visualizations is to tap unacknowledged parts of the person, and become aware of them, such as hidden needs or strengths. The extent to which this is possible depends on the insight of the people concerned. For people with little insight, the journeys will remain at their face value, but can nevertheless be worthwhile. They can be used on several different levels: for instance, as story-telling with children or people with learning disabilities, to stimulate their imagination; or as an approach to any theme for adults, to help them feel their way into it. At a deeper level, they can bring up some very powerful images, which can stay with people and sometimes be very upsetting. So care is needed to keep the level light enough for people to cope. If this is done, they can lead to enjoyable and worthwhile experiences. Some means of relaxation are needed at the beginning, and the level chosen may influence the depth of the subsequent experience. At the lightest level, members of the group just close their eyes so that they can ‘see’ the images in the story as the facilitator tells it. A useful mid-level of relaxation can be reached by asking people to sit in easy chairs, or back to back on the floor, and going through some simple relaxation exercises (close eyes, let go of bags, open hands, feel chair/floor, feet on ground, comfortable). A deeper relaxation is achieved with the group lying on the floor (eyes closed). People are in a state of greater suggestibility in this state. This can be too much for some groups and may be inappropriate in some settings (e.g. short-term groups in which little is known about the participants). When people are relaxed, the facilitator tells a story consisting mainly of images, concentrating on the sorts of details that enable people to bring back memories, or to visualize their own version of what is being described. It is important to tell the story or describe the journey slowly to allow people time to select the right memory or see their own details, e.g. of a tree. This process is important and cannot be hurried. Practice is needed to find the right pace. Often in imaginative journeys there is a definite transition point to ‘another world’, e.g. a door in a garden wall. It is most important to bring people back through that door and back into present time. At the end of the trip, everyone is asked to paint an image of their inner journey. This is usually a period of quiet concentration in which people are still ‘digesting’ their experience. Verbal sharing is probably most usefully left until afterwards, unless there is an obvious need for it. You are in a beautiful spot by a warm lagoon…you dive in, find some underwater rocks…there is a cave…you swim through…find an opening…then meet someone who gives you a gift…you receive this and return through the cave. Afterwards, paint the person you met and the gift you received. You are walking through some woods…find a path…follow it…come to a gate in a wall…go through…private/secret garden…explore it… see a house…decide whether to go in or not…what is it like?…maybe meet someone…what happens?…and return through gate and path. Go for a walk…come to a meadow…sunshine…tree…flowers… look at them, feel and smell them…stream…boat…into a tunnel secret cave…what do you find?…returning from the cave…and so back home. Go for a walk…find a doorway…what is it like? Familiar or unfamiliar?…decide to open the door…is it hard or easy?…open the door and go through…what do you find? You are shipwrecked on an island…you land…what is it like?…what do you do first?…if you are part of a group, what do you decide to do all together?…how do you get rescued?…what do you feel when you return? Visualize a landscape without life…imagine a little seed which has remained hidden for a long time…where is it?…what might happen if it was watered and cared for?…does the seed grow?…what happens to it? Imagine being a mythical character…setting out on a journey…where to?…having adventures…what sort of adventures?…finally arrive home again. After the journey do a painting about the journey or one aspect of it. Heads in a circle, one person starts with what she/he sees in their imagination, then another takes over, creating group fantasy. This is a method used by Dorothy Cameron (1996) with homeless people. People come to the group and do an immediate first painting about how they are feeling, to let off steam. This is followed by a period of relaxation and meditation, sometimes with music, sometimes with guided imagery. Then group members do a second, more reflective, painting in a calmer state of mind. Discussion includes both paintings. Or any other music with pleasant-feeling possibilities. Can be a good way to end a session. Breathe deeply…be aware of the group as a circle…imagine glow of light round each person…gradually watch light join into complete circle …notice how far light spreads out…follow it gently…imagine breathing in this light…going down into chest…spreading into body… name each part…and out through fingers and toes…feel the light and warmth…come back to familiar self and open eyes. Visualize yourself doing something you have always wanted to do, then create a painting about an aspect of what you saw. Variation: visualize yourself overcoming a problem or dealing with it in a new way. Go into a garden…seated on the ground or a bench is someone you have lost…you greet each other and talk a while…there is something you would like to have said to that person before you lost them…this is an opportunity to say it…soon after your conversation comes to an end… you say goodbye…you both leave the garden, but in opposite directions. When you come out of the visualisation, paint any aspect of it that was particularly meaningful. Variation: paint or make an object to commemorate your taking leave. 1. Each person talks about his or her work, without comment or questions from others. 2. In addition to (1), other people ask questions and make comments. This needs to be done sensitively. If a comment is not accepted by the painter, it may be because she/he is not ready for it, or because the comment is inappropriate. In either case, it would be unwise to take it any further. 3. People reflect and see if their paintings ‘speak back’ to them. 4. Artwork review. It can be rewarding to look back at pictures done over a period of time to see if there are any patterns or recurring themes. Sometimes people can see pictures they did some time ago in a fresh light, and this can bring new realizations. 5. Gestalt technique. This can be used with any art piece. The painter is encouraged to talk about the picture in the first person and to become each part of the painting in turn. The assumption behind this is that different parts of the painting may represent different sides of someone’s personality. For instance: ‘I am this tree. I’m quite a strong tree, and I’m well rooted, but I don’t seem to have many leaves. It’s winter and I’m cold and bare.’ After this, the speaker may reflect on whether this rings true for him or her in a wider way. After becoming each part in turn, one can go on to create a dialogue between the different parts of the painting representing different sides of a person. This technique can be very powerful so is best used in a small or established group where there is a lot of trust and support available for group members.